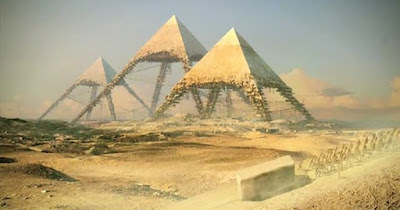 The ancient pyramids of Giza, Egypt have been shrouded in mystery and controversy from the beginning of civilization. And it seems that the more archaeologists delve into the topic, the more questions they end up with. Not only is Giza one of the most advanced ancient constructs found on the entire planet, it also contains the only pyramids found on the planet with eight sides. And what makes that all the more mysterious, is the fact that each block weighs around two to thirty tons a piece. With the Great Pyramid of Giza being composed of 2,300,000 blocks by itself, many remain puzzled regarding its construction. How exactly would ancient man have had the advanced machinery required to carry such weights? Furthermore, the pyramid is located in the center of Earth’s land mass, meaning that ancient Egyptians would have known the exact size of Earth. Sadly, not even one expert has been able to begin unraveling the mysteries surrounding the pyramids. That is, until now, because in the following YouTube documentary, they begin attempting to explain the processes that were used to construct the Pyramids. While we cannot verify whether or not the theory proposed is correct, what can be said is that it is a very interesting concept. Watch it for yourself, and let us know what you think.